Our WetlandLIFE project ( www.wetlandlife.org), part of the Valuing Natures Programme (valuing-nature.net) is now in its second year. This means our fieldwork research is well underway. Spring has finally sprung on our wetland case study sites; and last week we visited Shapwick Heath wetland, part of the Somerset Levels close to Glastonbury. The University of Brighton team are busy not just enjoying these spaces, but are also beginning the many fieldwork interviews that will help us really understand what these wetland spaces mean to so many different users. One of the many joys of uncovering a ‘sense of place’ in these very special landscapes is being able to walk and talk with our wonderful interviewees in the nooks and crannies of the wetlands that they love the best. This often means a meander through woodland pathways and time to stop and pause to listen to the boom of a distant bittern, or admire the delicacy of a dewy spider’s web after a rain shower. 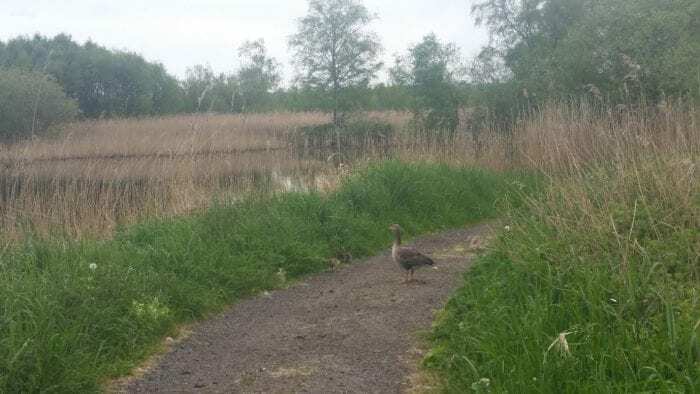 Of course, sometimes obstacles block our progress – such as these sentinel ducklings with their mother, making us wait patiently for five or so minutes before we could finally set foot upon the Sweet track – the reconstructed Neolithic wooden pathway which spans Shapwick Heath. The original footprints of this trackway, which enabled humans to easily traverse the boggy terrain, were found by engineer Ray Sweet in 1970. He was working excavating the natural peat beds around this area, a practice which has supported the local economy for the last hundred years. These peat excavations lead to the creation of the pits which, since being artificially inundated, now form some of Shapwick Heath’s water bodies. Looking at the Sweet track, and having paused for ducklings to bumble along, leads to a consideration of past lives within these wetlands. 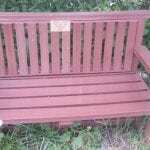 Dotted amongst all the three case study sites (Priory and Millennium Country Parks in Bedfordshire; Shapwick Heath and Westhay Moor in Somerset and Alkborough Flats in North Lincolnshire) are donated benches, with memorial plaques attached. Some, like the one below dedicated to ‘Trix and Ken’ are nestled by the side of a small copse, looking out over the reed beds. Sitting here, one watches the changing light, hears the sound of the pink footed geese on the water, feels the wind scuffling jacket collars. No wonder it was such a special place for them. This bench then becomes something else; a modern day reliquary, symbolising a cherished space, shared by two people who, though no longer with us, also wished to pass on its importance to others. 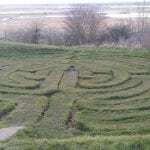 The playfulness of the labyrinth drew Mary to consider the wooden labyrinth constructed in Priory Country Park, one of the Bedfordshire case study sites. At almost two metres tall the wooden structure prevents the wanderer from easily finding the central space. With a mix of anticipation and apprehension you enter – getting an almost childish thrill of fearing about what may be lurking around each slatted bend. 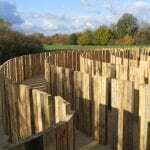 Of course, it’s a peaceful, happy place – and as it’s located adjacent to the children’s play area, as your sight of the wetlands becomes obscured as you enter the maze, what is magnified are the sounds of children’s laughter and shouting. This artefact is designed for the living, to be touched and to enable the user to hide and reveal at their leisure. So human constructs in wetland spaces can be many things – linking the past with the present, linking past lives and the people who use and enjoy these spaces now. 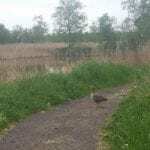 The WetlandLIFE team considered once again the bridge between the past and the present, and also the way all these wetlands are used and enjoyed differently with the changing seasons. This called us back to days of hats and gloves earlier this year. Venturing out along Alkborough Flat’s footpaths with the local council’s chief ecologist on a cold Wednesday in March, we spotted amongst the willow and hazel saplings a mossy stone, sitting hugger mugger with the snowdrops. 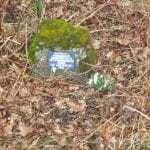 The stone had its own small inscription, almost impossible to decipher in the close covered woodland. It reads: ‘planted by the Wanderlust Rambling Club to celebrate their golden jubilee 1982’. And they’re still going strong today thirty five years later. So remembrance is not just for times and lives past – but also an ongoing celebration and appreciation of friendship, health and wellbeing in the here and now. When is the right time of year to visit these wonderful wetlands? The answer can only ever be – the time is always right. These landscapes call to humans across time, whatever the weather, whatever the occasion. This entry was posted in Environmental science, Life at Brighton, Research, Uncategorized.